I was in the middle of a good catch-up text session with a dear long time friend from MN the other night when I realized how easy it is for the things I say to sound like catch phrases and trendy self-help lines I might find tucked inside my Chinese take-out desert. I suppose in any regular face-to-face conversation, these might be taken at face value and as wise words, however in the context of text messaging (and probably emailing, blogging, or small talk), I was rolling my eyes at myself. My roommates used to say I was an old man in a young man’s body. That probably had to do with my enjoyment of smoking a pipe, reading old smelly books in rocking chairs, and watching birds. Another friend recently told me my sweater looked like something Mr. Rogers would wear. As a trained spiritual director at 31, I have to be aware of what I say. The things that come out of my mouth may not have the same weight as if I had a bit more gray hair or more wrinkles. Gravitas comes with age… try putting that one in a fortune cookie. I am trying to surround myself with influence that encourages a bit more creativity and originality to my voice. Swearing helps too. .you must “take” time.. the thread is yet thinner. SundayAM.. Wanna talk.. This is influence I can use. I’m finding my voice… In fact, I’ve probably already found it. A bit quirky at times, maybe sounding like something an old man would say sometimes, probably some good swear words thrown in there. But my own. I wouldn’t really fit in a fortune|cookie. I don’t like them that much anyway. Love this post Nate. I think finding(or, really, trusting) one’s own voice can be a real challenge. 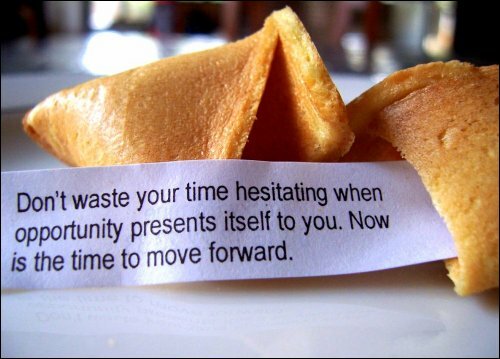 I know I also face the “fortune cookie cliche” syndom myself sometimes. I find myself saying things that to me have lot of depth, but to other people might just come off as… well, trite would be a good word to start with. The interesting thing I’ve found is that the further I get on this journey, the more profound simple statements are. “We’re all one,” used to just sound like some hippy-dippy garbage. Now I’m starting to grasp some of the ways that statement is actually a really profound and useful statement about creation.